(Nanowerk News) A record-setting X-ray microscopy experiment may have ushered in a new era for nanoscale imaging. Working at the U.S. Department of Energy (DOE)’s Lawrence Berkeley National Laboratory (Berkeley Lab), a collaboration of researchers used low energy or “soft” X-rays to image structures only five nanometers in size. This resolution, obtained at Berkeley Lab’s Advanced Light Source (ALS), a DOE Office of Science User Facility, is the highest ever achieved with X-ray microscopy. Shapiro is the lead and corresponding author of a paper reporting this research in Nature Photonics. The paper is titled “Chemical composition mapping with nanometer resolution by soft X-ray microscopy”. 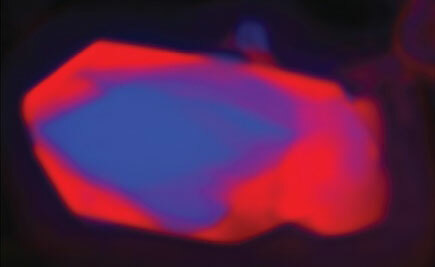 Ptychographic image using soft X-rays of lithium iron phosphate nanocrystal after partial dilithiation. The delithiated region is shown in red. Key to the success of Shapiro, and his collaborators were the use of soft X-rays which have wavelengths ranging between 1 to 10 nanometers, and a special algorithm that eliminated the effect of all incoherent background signals. Ptychography measurements were recorded with the STXM instruments at ALS beamline 11.0.2, which uses an undulator x-ray source, and ALS beamline 5.3.2.1, which uses a bending magnet source. A coherent soft X-ray beam would be focused onto a sample and scanned in 40 nanometer increments. 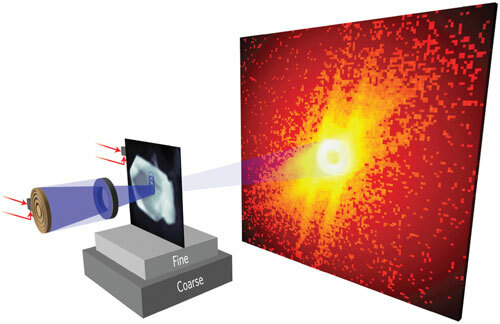 Diffraction data would then be recorded on an X-ray CCD (charge-coupled device) that allowed reconstruction of the sample to very high spatial resolution.